When using a "Variable" sequence step within a Process Plan, it is possible to branch depending on the result of the variable. 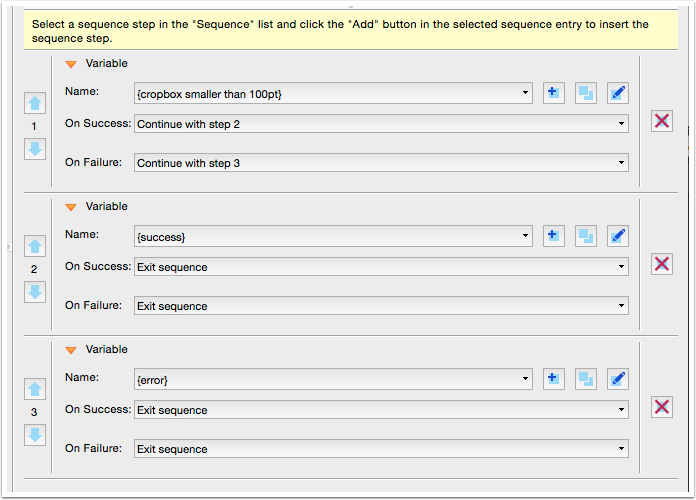 This sample uses a "Variable" step in step 1, which continues processing with step 2 in the case of "Success" or jumps to step 3 in the case of an "Error". In order to try this out yourself, please execute the attached Process Plan "Branch_on_script_result.kfpx" with the activated "Log profile execution" option (in the fly out menu in the upper right of the Profiles/Checks/Fixups window) in the desktop version of pdfToolbox.